The Tawharanui Public Planting day held on 3 June was affected by heavy rain. Revegetation of natural plant communities is critical to the future of the open sanctuary. Our aim is to take land that has been cleared and farmed for decades and make it habitat for native animals. We plan to have a total of around 350 hectares of forests and wetlands through protecting and enhancing remnant forest, replanting, natural regeneration and re-instating natural water flows. This is a long-term project that will take the next 25-50 years. Our goal is to create a representative range of natural communities that would have been originally present including coastal forest, dunelands, cliff, rocky and sandy shore communities and saline and freshwater wetlands. Most of this area has already been retired from grazing and fenced off. Restoration will create links with existing forest areas and provide a diverse range of habitats. It is also an important focus for TOSSI activities in one of the largest revegetation programs to be undertaken on the Auckland mainland. Natural regeneration takes a long time in retired pasture and much of the restoration involves planting new plants - lots of them. To achieve this TOSSI operates its own nursery at Tawharanui that produces 20,000 plants each year. Our nursery volunteers collect seed from local plants, germinate them and grow all the plants we require for our revegetation program. 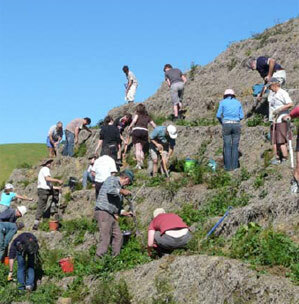 The planting program is planned years in advance and is conducted according to site-specific revegetation plans developed by the Auckland Council. Each site is planted with a particular range and number of native plant species. Every year TOSSI and the Auckland Council conduct a number of planting days during winter. Hundreds of people help out - you can too. Your donation will help protect the plants and animals of Tawharanui Open Sanctuary. All donations of $5 and over are tax deductible.